In mid-1997, I decided to take the plunge and buy myself a PlayStation game system (which turned out to be a very good decision). The first game I ever played was the now-classic Wild ARMS, designed to be Sony's ultimate foray into making role-playing games for a more advanced technical system, the game was quickly forgotten when other, bigger name titles, took over the press. Two sequels later, Wild ARMS still has its devoted fans and appeals to a special kind of audience with its unusual part-Western/part-futuristic/part-fantasy setting. Now Sony brings us an anime series based on the same concept, entitled Twilight Venom, and should instantly appeal to fans of the video games. It should be noted, though, despite the claim that it's "based" on Wild ARMS and Wild ARMS 2nd Ignition, a more accurate description would be that it borrows bits and pieces from the video games in order to make a complete show. Set in the world of Filgaia, Wild ARMS starts off with a bang by immediately following the adventures of the very mysterious Dr. Arronax, a scientist once involved with secret government projects, but now on a personal quest that he keeps very private. As things start, Arronax is captured on the floating, sky-prison of Alcatraz. He hopes to find evidence of ARMS, the ancient weaponry that once caused the destruction of the world. He ends up finding a small boy who is trapped in stasis. When the boy is awakened, he claims to be Sheyenne Rainstorm, a once infamous gunfighter. Problem is, Rainstorm was in his 20s, and this boy looks to be barely ten. The solution is simple: when Rainstorm was shot and killed years ago, someone took his brain out, stole his body, then implanted the brain in this small boy. Now Rainstorm quests to find his original body and solve who is responsible for his situation, but meanwhile, he is the only human capable of operating the ancient ARMS. Arronax and Rainstorm link up together in their mutual missions, while at the same time constantly crossing paths with two bubbly female thieves whose sole aim in life is to find ancient treasures and sell them to the highest bidder. In the style we expect, the anime is designed like a Western (complete with Ennio Morricone-influenced theme music), but its elements are of mixed origin. We have the presence of dragons, weird monsters, and mysterious technology, but yet the setting is very simple and straightforward. The attitude is very lighthearted as well, and there's little in the way of serious drama or plotlines. Everything is paced a mile a minute, which moves the series forward very well. It's also extremely non-linear; there's virtually no connection between the episodes at all, other than the basic premise of Sheyenne Rainstorm searching for his body. There are a few nods to the video game series, though. Arronax seems to be at least partly inspired by "Jack," the treasure hunter from the original Wild ARMS game, and like Jack, he has a small, mouse-like companion with a big attitude. Sheyenne feels a lot like the "Rudy" character, and the two thieves have many aspects that remind me of other parts of the ARMS mythos. All in all, it's a fun show with a lot of spirit, character, and clever mini-plots that rarely have anything to do with the big picture. Part of me wishes there was a little more cohesion in the main storyline and that more stuff was explained, but I guess that would ruin some of the charm. Image Transfer Review: Crisp and new, the animation and transfer quality are up to the usual ADV standards of being free of digital problems. The colors and detail are brilliant and sharp without bringing out a lot of dot crawl or moire patterns. It's very solid and should easily please animation fans with its faithful rendering of the show, whose often dull and drab locales never prevent some creative artistry here and here. Audio Transfer Review: The 2.0 Surround audio is fitting and very much appropriate for each scene and sequence, but never gets particularly active. Instead, it remains fairly subtle and effective. Occasionally some of the noisier sequences really get powerful and immersive, but it sounds well mixed as opposed to just wild and out there for no good reason. The English dub is acceptable, but occasionally makes some questionable decisions regarding how the story is treated, which is sometimes altered slightly. Extras Review: Additional features include a textless opening and closing credits sequence (which is actually fairly interesting given the dynamic nature of both), a gallery of conceptual art and character model work and voice dubbing outtakes. The outtakes are for the English dub and, admittedly, aren't particularly funny; they're just some basic flubbed lines and bad cues. Also included is the original Japanese preview reel for the series, which is a very odd combination of ideas that is hard to explain. The disc's presentation is quite nice with a great cover and quick, clean menu design. The "Western" theme is carried well without overtaking the approach to presentation. 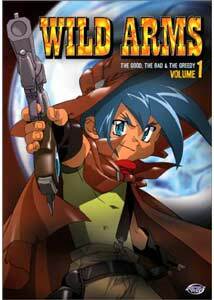 Wild ARMS is not at all just an anime for fans of the video games; it has a broad appeal and it shows. It doesn't take itself very seriously and has a fun, upbeat nature that really allows the characters to be a little silly without it ruining any dramatics. For now, this first volume makes a great start to the adventures of these unusual characters.